“But it is the chief subject of all Holy Scripture to know and understand God when He makes a promise. For He helps and brings support even with the actual realization of His promise and when it is fulfilled; but before this He disciplines faith in the promise by means of a lack of the things of which we are in need. He does this in order that we may learn to trust Him and not to tempt Him” (LW 8:201). Quotation is from Luther’s Works, the American Edition: vol. 8, copyright © 1966 by Concordia Publishing House. All rights reserved. Quotation is from Luther’s Works, the American Edition: vol. 78, copyright © 2015 by Concordia Publishing House. All rights reserved. The following excerpt from the great reformer Martin Luther is taken from What Luther Says, a collection of more than 5,100 quotations on 200 subjects gleaned from his writings. Faith is not the human notion and dream which some regard as faith. And when they see that it is not followed by an improvement in life and by good works and yet still can hear and talk much about faith, they fall into the error of saying: Faith is not enough; we must do good works if we are to become godly and be saved. The reason for this lies in the fact that when they hear the Gospel, they go to work and by their own powers form in their hearts an idea which says: I believe. This they then consider a true faith. But, being a human figment and idea which never reaches the depths of the heart, it is inoperative, and no betterment follows. Faith, however, is a divine work within us. It transforms us and gives us a new birth wrought by God (John 1:13). It slays the old Adam, makes us entirely different people in heart, spirit, mind, and all powers, and brings with it the Holy Spirit. Oh, a living, energetic, active, mighty thing is this faith. It is impossible for it not to do good incessantly. Nor does it ask whether good works are to be done; but before the question is put, it has already done them and is forever doing them. He, however, who does not perform such works is a man without faith (glaubloser Mensch), who gropes and looks about for faith and good works and knows neither what faith is nor what good works are, although he prates and prattles much about faith and good works. From What Luther Says: A Practical In-Home Anthology for the Active Christian, pages 408–9 © 2006 Concordia Publishing House. All rights reserved. 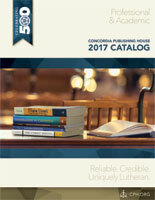 To order What Luther Says, please contact CPH at 800-325-3040 or visit www.cph.org. Christians are being called to defend their faith as never before—whether in the political sphere, in the work environment, and especially in personal discussions. Are you prepared “to make a defense to anyone who asks you for a reason for the hope that is in you” (1 Peter 3:15)? Making the Case for Christianity: Responding to Modern Objections, edited by Korey D. Maas and Adam S. Francisco and available now, introduces specific intellectual objections to the Christian faith and then demonstrates how these objections might rationally be answered. Topics covered include the existence of God, the Gospels as reliable history, Islam, the resurrection of Christ, the doctrine of salvation, good vs. evil, and atheism. Contributors include Dr. John Bombaro, Dr. Angus Menuge, Dr. Joshua Pagán, Craig A. Parton, and Rev. Mark A. Pierson.